HOW far should the government go to boost house ownership? Not at the expense of the banking sector, say economists. The Malaysian government has priced its ¥200 billion (RM7.3 billion) 10-year Samurai bond at a coupon rate of 0.63% per annum. Sarawak Pakatan Harapan (PH) chairman Chong Chieng Jen today expressed his confidence that a Bill to restore Sarawak’s status to its pre-1976 original position as an equal partner to Malaya will be passed in Parliament, only if 19 Members of Parliament from Gabungan Parti Sarawak (GPS) give their support. AirAsia X Bhd has announced the opening of a new direct route to Lanzhou, one of the largest cities in northeast China, beginning May 1. 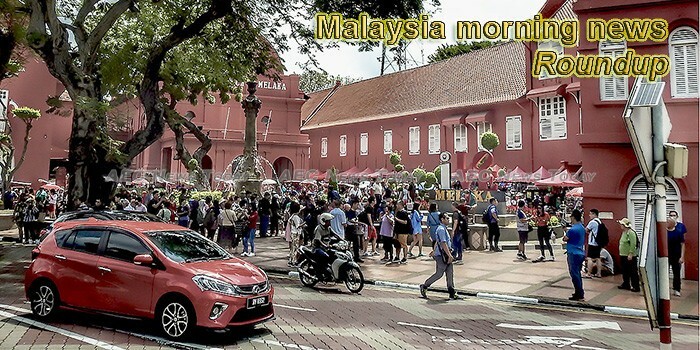 MALAYSIANS living near the Malaysia-Thailand border should take the opportunity to export their products to Southeast Asia’s second largest economy following the ringgit’s recent decline against the baht. In Mahathir’s new Malaysia, a perfect storm for the Pakatan Harapan? Ten months after a general election that overhauled Malaysia’s political landscape, its decimated opposition forces have begun rallying to win back voters by rebranding and repositioning themselves. By reinventing itself, Malaysia Airports Holdings Bhd (MAHB) hopes to be a catalyst for the redefined Malaysian economy, according to its group chief executive officer Raja Azmi Raja Nazuddin. Econpile Holdings Bhd has clinched a RM68.8 million subcontract to undertake piling, pilecap and basement works for Terra mixed development in Precint 8, Putrajaya. Prime Minister Tun Dr Mahathir Mohamad says the government would give the East Coast Rail Link project the green light if China contractors agree to significantly reduce the price. IT is barely two years old, but this agency is already making an economic impact through arts and culture. Nestle (Malaysia) Bhd has intryduced a new maternity policy for adoptive parents and primary caregivers, providing a generous leave package of up to six months. It is vital for Malaysia to remain a united and peaceful nation with political stability despite the existence of divergent political ideologies and views. A Malaysian minister has decried the presence of lesbian, gay, bisexual, and transgender (LGBT) groups at a march celebrating International Women’s Day on Saturday (March 9), calling it “a misuse of democratic space”. As Sarawak is set to accelerate its infrastructural development, analysts opined that Sarawak-based contractors and construction material suppliers are more likely beneficiaries to these projects. KEPALA BATAS: The Ministry of International Trade and Industry (MITI) hopes foreign investors will continue to have confidence in Malaysia’s economy. The slow progress of the US-China trade talks, coupled with the decline in the Shanghai and Hong Kong stock markets, dragged Bursa Malaysia to close lower on Friday. Integrated oil and gas player Sapura Energy Bhd which has been registering losses for the past few years, is expected to narrow its net loss in the coming fourth quarter earnings results, supported by its newly secured contracts and recovering crude oil prices. The growth of cashless payment options, including e-wallet, has grown exponentially in Malaysia and market observers believe it will continue to dominate the space in the coming years. The Ministry of Finance (MoF) has urged the public to be aware of any letter using its official letterheads or using minister Lim Guan Eng’s name as it could be a scam. Petroliam Nasional Bhd’s (Petronas) net profit rose 22 per cent to RM55.3 billion in the financial year ended Dec 31, 2018 (FY18) from RM45.5 billion in 2017, on the back of higher revenue and supported by a net write-back of impairment on assets. Celcom Axiata Bhd expects to achieve single-digit growth in total revenue in 2019 despite a flattish 2018 for the telecommunications industry. Only 17 per cent of businesses in Malaysia have a woman in the role of chief executive officer or managing director, said global professional services network, Grant Thornton International Ltd.
A Malaysian is sentenced to ten years imprisonment for insulting Islam and its founder Mohammed on his Facebook page, reports CNN.